There are a lot of crises facing the Orthodox Jewish community these days. Among the most important is Jewish education. It is a crisis of existential import. Leaving aside the serious problem of financing it (itself an existential problem) I don’t think it’s arguable that Judaism can be perpetuated without it. That has become abundantly clear to all Jewish denominations via the success of the Orthodox educational paradigm that has increased our numbers versus the relative lack of it in other denominations - which has led to their decreasing numbers. But what should a successful Jewish education look like? The obvious answer is to examine what it has been in the past, and to continue that model. Changes to it should be made with caution. Even if those changes are seen as positive in the short term. Until relatively recent times (say… 35 or 40 years ago) Jewish education in just about all Orthodox American high schools were of the Lithuanian model. In their American incarnation the curricula consisted of two primary components: Gemara study in the morning and secular studies in the afternoon. Even the most right wing Yeshiva high schools like Telshe and ‘Philly” (Lakewood’s high school) had this program. Those who attended these schools studied the basics so that they could - if they chose - go on to college and in some cases eventually become successful professionals. Some of the most notable Charedi leaders (both lay and religious) are college educated. For example - the executive Vice President of Agudah has a law degree. And the head of the Agudah Moetzes has a college degree. As did a previous head of the Agudah Moetzes, Rav Avrohom Pam, ZTL. In the early years post Holocaust, Survivor Chasidim sent their children to those schools. Until they built their own.Those schools have minimal secular studies at best. Some (most?) have no secular studies at all. What we have now is a reversal of the very success the older paradigm has given us. While there are still many Charedi professionals, I suspect that nowadays very few are interested in doing that. Secular education is now denigrated – same as it is in the Chasidic schools and in the Lithuainian schools in Israel. It is seen as Bitul Torah at best. While it is still true that there are many Charedim that eventually do get good jobs despite their lack of a good secular education, there are probably a lot more that don’t because of the lack of it. We know the results of that in Israel. Dire poverty. It is no secret that the Charedim of Israel are its poorest demographic. It is also true that Chasdic communities like Kiryas Joel and New Square are among the poorest cities in America. Shalom Bayis is often severely affected by that. It is also no secret that poverty is a major cause of family dysfunction. And that it increases the chances of children going OTD. The current state of affairs is not good for the Jewish people. I believe that there are many Charedi leaders who in their heart of hearts know this. One of the more erudite Charedi spokesman alluded to it in last week’s Mishpacha Magazine. Without spelling out what kind of change he meant Jonathan Rosenblum called for change in the Charedi community for existential reasons. He said that in order to preserve the gains made by the Charedi world (the extraordinary growth of the Torah community is undeniable – both here and in Israel) you can’t remain standing. He says that often times it is necessary to change course just to preserve those gains. His model for change is Sara Schenerir founder of the Beis Yaakov movement. He adds that it is difficult for our generation to appreciate the revolutionary nature of her movement. But in point of fact, one might justifiably say that she is the person that has done more for the Jewish people than anyone in the last 100 years. These are not my words. They are not even Jonathan’s words. They are the words of the famed late Rosh HaYeshiva of the Chevron Yeshiva, R’ Chatzkel Sarna, ZTL. True, she convinced many of the Gedolim of her day. But there were many that were opposed. It was a revolution. Sometimes, it takes a revolution to save Yiddishkeit. Right now that revolution ought to be one of going in reverse… back to a time where secular studies were valued. And it ought to be taking place in Israel as well. In my view the change that needs to take place is abandon the current Charedi zeitgeist of disparaging secular studies. Although most non Chasidic Yeshiva high schools still have secular studies programs, there is definitely a strong trend away from it. Secular studies are being characterized by some who even studied it themselves as Bitul Torah! This mentality prevents any further secular education beyond high schools (for those schools that still have it). How many Charedi professionals in America today have children that will themselves become professionals? I don’t know, but I’ll bet that the number is a lot closer to zero than it ever was (unless they have gone OTD). That magazine’s editor call’s such moves ‘reformist’. He condemns this organization and apologizes for carrying the ad saying that it was an error in the advertising sales process. 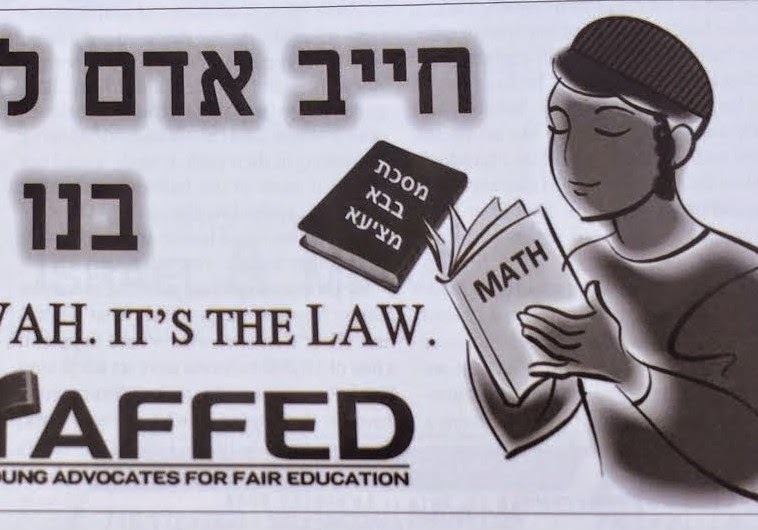 Whether YAFFED is going about it the right way is a matter of debate. Much the same as the debate about how the Israeli government is going about it. I will admit that force causes push-back. And that can backfire – making things worse. It would be much better if that change came by itself. But what if it doesn’t? Should we just stand by and watch an entire community disintegrate? Or should we force them to take this ‘life saving medicine’ against their will? The ‘medicine’ of education that will change their lives without changing their way of life. In my view, the answer is simple. As much as I would prefer they do it themselves, if they don’t - the life of the ‘patient’ is at stake. And it must be saved.